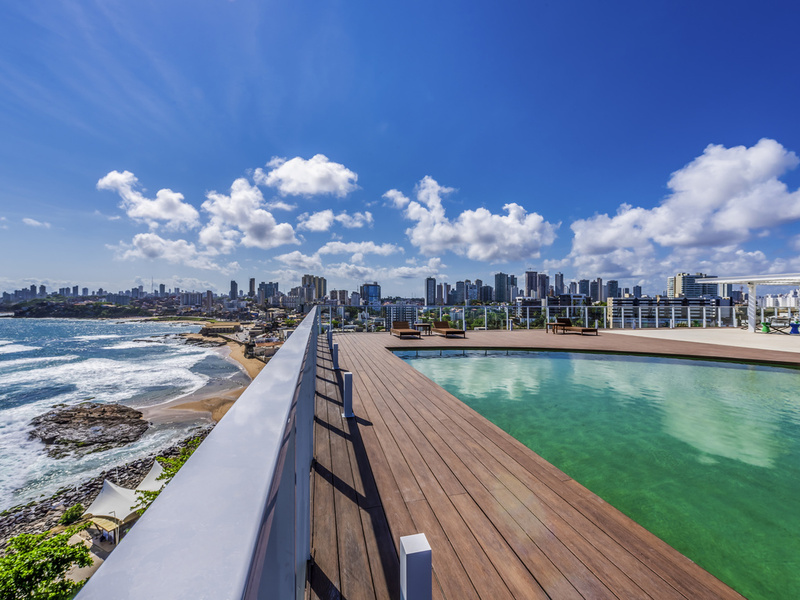 The Novotel Salvador Rio Vermelho is in one of the best regions to enjoy the nightlife & the sights of Salvador. Relax in modern, free WiFi rooms. Buffet breakfast offers regional delicacies, as well as freshly made tapioca and omelettes. Relax in an outdoor pool, enjoy the sea view while sipping a special drink. Has a restaurant, bar, laundry, gym, tennis court, sauna & event rooms for up to 250 people. Whether you're looking for a sophisticated lunch, dinner or just a cocktail, Trio welcomes you into a stylish, comfortable and relaxing environment, with a menu serving delicious global cuisine accompanied by a selection of fine international wines. Bar serving drinks, cocktails, wines, coffees, snacks and appetizers, in an inviting atmosphere with panoramic ocean views. Charming bar with panoramic ocean views, serving drinks, cocktails, wines, coffees and snacks.